Cultured foods are historically how we have gotten probiotics and maintained healthy digestive tracts. With the advent of pasteurization and the non-discriminatingÂ hyper-vigilanceÂ against all bacterium, supplements are the most common and reliable route to maintain healthy digestion. However, if you want to begin putting back in your diet (and want to know why) review my article on probiotics here and then give the tasty recipe below a try – this is a great way to use up the last of the garden tomatoes! Â Chop tomatoes into bite sized pieces, combine vinegar and olive oil with garlic and herbs and toss.Â Spoon over red kraut and mix gently.Â Chill and serve with fresh sliced avocado. 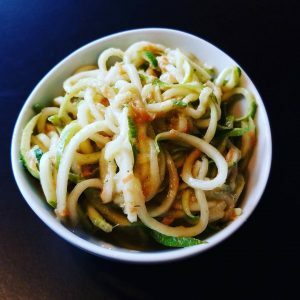 This recipe was initially inspired by a Matcha salad dressing I saw on a smoked salmon salad at Whole Foods, and further inspired by DoMatcha, a matcha tea company whose recipe, along with Whole Foods, served as the template for this creation. The earthiness of the matcha is well paired with the acidity in the vinegar and the sweeteness in the orange slices. Walnuts may be added for crunch, and the goat cheese can easily be omitted without sacrificing flavor if you are dairy intolerant. Be sure to include a fat source so that the antioxidants present in this salad are readily absorbed. Matcha is something I am going to be playing with in the kitchen this month. Matcha has been cultivated in such a way to provide deeper flavor and richer color than other green teas. It was its intense color that first drew me in. Matcha is made by grinding the whole, dried leaf into a powder. The process itself can take an hour to powder an ounce by hand, and this laborious procedure is reflected in price. However, the sweetness of the tea and the complex flavor profile add quite a bit of character and, in my opinion, makes the extravagant price tag worthwhile. There is also the significant health properties of matcha above and beyond other green teas. All green teas contain the coveted compound, EGEC (epigallocatechin 3-gallate), renowned for its anti-cancer properties, cardio-protective nature, and metabolic boosting ability. The EGEC present in matcha is significantly higher than traditional green teas because matcha involves drinking the leaf in its entirety, not an infusion of the leaf. This recipe pairs well with any white fish or Asian meal. I would recommend a grilled halibut or grilled shrimp as an accompaniment. Both these protein sources have a subtle sweetness that marries well with the citrus in the dressing and the earthiness of the matcha. 1/2 navel orange, sliced thinkly, sectioned and rind removed. Place matcha powder in a small cup. Add just enough vinegar to make a paste and mix until smooth. Add remaining vinegar, lime and orange juices, and ginger. Toss peppers, orange segments in the greens. Add goat cheese, avocado or walnuts and toss gentle to mix. Add dressing to taste and serve immediately. Serves 4. This dressing is wonderful in salads with salmon, chicken or beef as well as tossed in a cold or warm noodles (peanut noodles are a great hit with kids!). I enjoy it for aÂ fall salad dressing – it’s heavier and pairs well with robust greens such as romaine, radicchio, and will even mellow out chard, kale and the more bitter winter greens. Enjoy! Place all ingredients in the Vitamix and blend until emulsified. Thin with water, coconut milk, or rice milk if desired. If you do not have a Vitamix, I recommend dicing the garlic before blending. This salad is AWESOME. 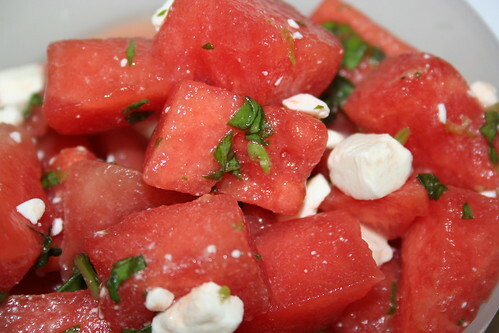 The basil and watermelon are refreshing and energizing, and the feta adds heartiness and depth that allows this to be quite satisfying. It keeps well for about 2 days. It is also fantastic without the feta! 1. In a large bowl, combine watermelon, lime juice, lime zest, basil; season with salt and pepper. Toss to combine. Refrigerate until chilled. Serves 4. Rather than indulging in a traditional American creamy, mayo-laden potato salad, I propose this alternative: a Greek-inspired potato salad that is far more refreshing and appropriate for summertime picnic tables. Use of small waxy red potatoes keeps the glycemic index lower than using russets and ensures firm texture. Red onions carry anti-inflammatory quercitin and the mint and lemon pair well for a truly refreshing side dish. Obviously, the feta is optional. If you include feta, I recommend a sheep milk feta, ideally raw and local, but imported is a flavorful alternative. Dice the onion into small pieces and cover with near boiling water to draw out the strength. Add the juice of ½ lemon. This creates a mild, and somewhat tangy onion that is less overwhelming to the palate. Peel the potatoes, cut into large bite-sized chunks of approximately the same size, and rinse well. Add potatoes to a pot of cold water to cover by 1 1/2 inches, bring to a boil, and boil at medium-high heat. Test after 15 minutes for doneness – they should be easily pierced with a fork. Remove when done, drain, and place onto a cookie sheet to cool. Transfer to a serving bowl or dish when cool. Add onions, olives and optional feta and toss. To make the dressing, in a small bowl, combine olive oil, lemon juice, mint, salt, and pepper with a whisk. Serve at room temperature or chilled. When ready to serve, pour on the dressing, toss, and sprinkle with parsley. There is an abundance of arugula in my yard. I was originally considering an arugula pesto, but I am well underway on my winter cleanse and am not consuming pasta (rice, quinoa or otherwise). I proposed a salad to go along with dinner on Sunday, and a roommate asked if that salad could be warmed. I’m not accustomed to making “warm salads”. Typically my greens are cold and raw or sautéed. In a mood to take on a challenge and get crazy in the kitchen, I set out to find a “warmed salad” using arugula and other ingredients available. The recipe below is the result: a winter salad adapted from a recipe I found on thekitchn.com. It was an incredibly nourishing, yet lighter addition to Sunday dinner than steamed or stir-fried winter greens. There is still an arugula overgrowth happening outside. I am wondering – what are you favorite recipes for arugula? I’d love to hear your ideas and recipes. Click here or on the comment tab below and share your kitchen magic! Heat the oven to 500 degrees F. Toss the cubed sweet potato with the oil, spices, salt and pepper. Spread thin on a large cookie sheet and roast for about 15 minutes, or until browned at the edges. Meanwhile, heat a cast-iron or other teflon-free skillet on medium high heat. Toast walnuts, stirring frequently, until aromatic and lightly browned (about 5 minutes). Whisk dressing ingredients together, or blend at high speed for greater emulsification. Toss hot sweet potatoes with the arugula and walnuts. Drizzle the dressing over the salad to taste. Salad will wilt slightly, which is desired. This salad was adapted from a recipe in the June 2007 issue of Gourmet and originally found on Epicurious.com. Michael detests most fruit (at least he likes his veggies!) so we omitted the 1/2 cup dates the recipe originally called for and added more ingredients to make it a heartier, entree type salad. This would also be fantastic with steamed haricot verts and chickpeas or with flaked tuna a la Salade NiÃ§oise. 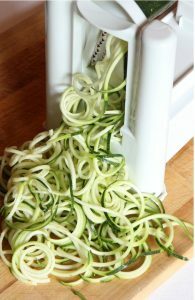 Attention Vitamix owners: Throwing all dressing ingredients in a Vitamix at speed 9 for 15 seconds emulsifies the dressing and slows seperation significantly. 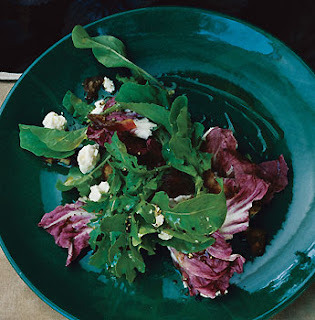 Toss together arugula, radicchio, feta, and veggies in a large bowl, then toss with enough vinaigrette to coat. Top with hardboiled eggs, and sprinkle with freshly ground pepper.